In the 1970s Atlanta's skyline was largely filled with nondescript concrete buildings, except of course for the Westin Peachtree Plaza (from where this photo was taken), which was built in 1973. The 1980s ushered in an era of signature buildings and that era continues today. 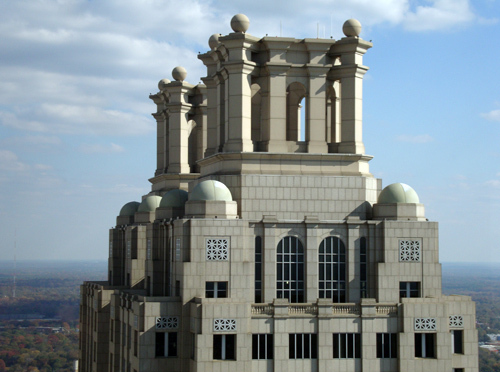 The 50-floor One Ninety One Peachtree Tower (photo), sometimes written 191 Peachtree Tower, was completed in 1991. Of all the buildings in downtown Atlanta, the 191 is my personal favorite. Not only for its Gothic seven-story rooftop crowns made of columns, arches, and domes, but also for its seven-story atrium that features huge chandeliers that I think remarkably resemble Fabergé eggs. One Ninety One Peachtree Tower also is an award winner. Twice it has received BOMA's "The Office Building of the Year" (TOBY) award, in 1991 and again in 1998. Rather intimidating from the street. Everybody should check out the lobby for the space, the stone finishes and the art: Ray King's colossal light sculpture "Atlantis" next to the escalator and Helena Hernmarck's monumental tapestry "Urn." Then see the Victorian portrait gallery in the Ritz foyer adjoining the 191 Lobby.